Get the makeup tips you want and hear it from our local celebrities tomorrow, May 30 at 4pm. Learn on how to look right with your makeup products and techniques on Sunday, May 31, same time at 4pm. Grab this chance and save yourself from paying hundreds of bucks going to salon just to have your face done. Enjoy exclusive freebies only at Paul and Joe! Visit them at first Floor, Cosmetics Area, Rustan’s Tower, Shangri-La Plaza, from May 30 to June 1. Email beautyinsider@prestige.com.ph to confirm your attendance. Learn about the latest educational tool being used in top US universities and High Schools! These team-based workshops allow the participant to build, program and run their own robots using Lego Mindstorms for Schools™. Challenge yourself by creating robots that does your every whim! Create robots that respond to light or motion, navigate through a maze and even challenge another robot! The only limit is your imagination! The Tiny Kitchen 1 course is composed of 5 sessions, with a main dish and dessert taught at each session. P 4250. The Basic course is composed of 5 sessions, with a complete menu taught at each: a main dish, dessert, side dish and drink. All the basic cooking techniques are covered such as yeast doughs, pie crust and decorating with buttercream icing. P 5750 (for old students) / P 6250 (for new students). Available only for those who have completed the Basic course. The course is 5 sessions long and each menu focuses on a different country and basic cooking skills are reviewed and reinforced. Monday to Saturday [except Fridays] (afternoon schedule): 2 PM to 4 PM. The 8th Philippine Toys, Hobbies & Collectibles Convention 2009 is the biggest and largest convention in the Philippines for comics, anime, toys, movies, cosplay, gaming and collectibles. Get the latest, hottest and rarest finds at the convention, meet some of the most distinguished artist illustrators, contests, booths, and more at the convention! Get tips of the latest in the beauty and wellness industry with the Beauty & Fitness World 2009 and Spa & Wellness Philippines 2009. Venue: World Trade Center, Gil Puyat Ave. Extension cor. Diosdado Macapagal Blvd. Ricky Lee invites you to the book launch of "Si Tatang at Mga Himala ng Ating Panahon: The Special Collector's Edition" on May 31, Sunday, 3:00-6:00 PM at Powerbooks Megamall. The book is a special edition of Ricky Lee's collection of short stories and articles, as well as the screenplay of Himala, the CNN Viewer's Choice as the Best Asia-Pacific Film of All Time. "Sa antolohiyang ito, walang duda na ang pinakadakilang himala ng ating panahon ay ang manunulat na si Ricardo Lee. Bawat anyo ng pagsusulat na kanyang hawakan ay nagpapakilala ng kahusayan ng kanyang panulat at ng malalim na pagkabatid sa mga suliranin ng tao at ng lipunang ginagalawan nito." -- Bienvenido Lumbera, National Artist for Literature. Royal Sportsfest Back to School Sale! Be moonstruck over discounts of up to 70% on selected items from participating stores! Join the spree at the Double Midnight Madness Sale! Free Parking for four (4) hours for a minimum single purchase receipt worth P1,000 dated May 29-31, 2009. Buy 3 Take 1 Cinema Ticket on the last 2 show screenings at Glorietta 4 on May 29-30, 2009. Pay P16O for a P200 Powercard load and get two (2) Yellow Swiper games for FREE from May 29-31, 2009 at Timezone. Valid at TIMEZONE Glorietta 4 and Greenbelt 3 only. Expect more: The latest at the lightest rates! At Real 0% interest and triple credit limit, you can upgrade to the latest computers and gadgets without straining your budget. Visit the Glorietta Activity Center from June 11 to 28, 2009. Marc Ecko is holding its first Ecko Unltd. Global Art Battle. Their goal is to tap local artists to be part of the competition and represent the Philippines—a great opportunity to showcase Filipina talent on a global scale. Winners from each country chosen by Marc Ecko himself will have their bio and art announced on the Ecko Global Website, receive $1000 worth of Ecko products, and have their artwork featured on the official Spring 2010 Ecko collection. Deadline of entries is on May 8, 2009. For more information, visit the competition’s official website, www.eckounltdartbattle.com. May 15-17 at East Grand Mall, Sta. Lucia. Join the first ever Papemelroti Creative Journaling Workshop to bring out the art in you! Express yourself in a unique way!!! Features Papemelroti artist Patricia Paterno. at the Main branch, 91 Roces Ave., QC. Limited slots only. Fee: P500. You may bring your own art materials or kits will be available for sale also. Aerosoles, 2/F Eastwood Mall: Reduced prices on selected regular items up to June 30, 2009. Just G Summer Sale: 25% to 70% off on selected items up to June 6, 2009. Gingersnaps Summer Sale: 25% to 70% off on selected items up to June 6, 2009. Kenneth Cole: Customers who spend a minimum of P4,500 on full priced merchandise during a single visit to a Kenneth Cole Reaction store will receive a free gift. 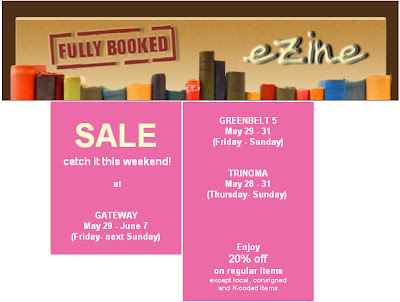 Espada, 2/F Eastwood Mall: Up to 40% off on selected items up to April 30, 2009. Whoops, 2/F Eastwood City Walk 2: Up to 70% off on selected items up to June 12, 2009. Superga, G/F Eastwood Mall: 50% off on selected Fall-Winter 2008 styles up to April 27, 2009. Soho Tote from Michael Kors Source: Stores Specialists Inc.
Customers are entitled to special discounts on selected DKNY Jeans from the new Spring 2009 Collection. Same day purchases only. Customers are entitled to a Limited Edition 20th Anniversary Umbrella. Get a 10% off when you buy at Ensembles. You will also be added to their mailing list so you will have the opportunity to know theie latest sale event, promo or collection! he sale with a green cause. Get up to 70% discount* plus perks as you shop, dine and play! Shop, dine and play every day of the sale because every P1,000 single receipt purchase entitles you to a raffle coupon and P1.00 pledge to the World Wide Fund for Nature! Havaianas flipflops, Crumpler bags, iPod shuffles and Sony digicams await green shoppers! Shop using your Eco Chic Sac to get a bonus raffle ticket. Mom & Me (May 23-24): Register Now! Power Plant Mall, together with TUTORING CLUB & CREATIVE HANDS brings "Little Artists at Work", arts & crafts classes for Mom & Kids from 6-12 years old! ALL CLASSES ARE FREE OF CHARGE. Ace Water Spa's Summer Escapade Luau Party on May 22-23! Get a free Penshoppe Sling Bag for a minimum net purchase of P1,500 in a single receipt. Promo runs May 16 – June 15, 2009 in all Penshoppe boutiques nationwide. Please see flyers for details. Post an ad now for FREE and win one of these amazing prizes! Hurry! Post now! Promo period is from 06 May 2009 to 03 July 2009. There will be seven weekly raffle draws. All entries for the weekly draw are eligible for the Grand Draw on 4 July 2009.
to qualify for the grand raffle draw. Hurry, Post an ad now! Fully Booked celebrates FREE COMIC BOOK DAY on May 23, 2009. Come to Fully Booked and get a comic book absolutely FREE! No need to buy anything! Plus all graphic novels will be 20% OFF! Comic giveaway starts at 10AM. First come. First Served. Available in all Fully Booked branches. 20% discount applies on cash purchases only. Locally consigned items are not discounted. The GOETHE-INSTITUT will be showing German films every last Saturday of the month in U-View, Fully Booked Bonifacio High Street at 5PM. Admission is FREE! A fast-paced film that gives viewers a look at the Berlin hip-hop scene. This part documentary, part film follows a number of people over the course of a day in Berlin. Yaneq is trying to organize one of Berlin's biggest parties in just 24 hours. Tarek dreams of turning Berlin into an enormous grafitti sculpture, while Session, a rapper, is trying to flee debt-collectors and protect his girlfriend. The fantastic breakdancers the 5 Amoks also make an appearance, as well as many others. In one night and the following day, the various strands of this story blend into a pulsating film that celebrates all things associated with the youth: young love, youth problems, their dreams, and, of course, their music. Appreciate and learn more about the art of wine-tasting and wine and food pairings through a wine class held by Rene Barbier. Attendees will be trying out the different variants of Freixenet Wines and Cava, Rene Barbier Wines, and Yvon Mau Wines plus you bring home a goodie bag which has a wine booklet, Droste Chocolates, Gallo Pasta, and more. Get a 10% discount coupon from Make Up For Ever when you purchase any Beauty or Fashion book from selected Powerbooks branches! Participating brands include Apple, Canon, Asus, MSI, Dell, HP, Samsung, Lenovo, Acer and Kodak. Use your credit card to avail a 0% interest up to 12 months! The PSI Kids seminar is a fun-filled active experience for kids 5 – 12 years old. Children have the chance to practice making choices and dealing with the consequences; they have an opportunity to experience a responsibility without compromising their natural playfulness and joy. As they learn responsible ways of acting they have the freedom to let go of manipulative behaviors. The PSI Kids seminar helps to bring out the best in every child. Shy, retiring children may need support in overcoming fears or speaking up to voice their requests. Children who are very active and demanding may need some coaching in how to share, listen or just slow down. Each child is encouraged to become more aware of his or her own strengths. PSI Kids learn to work with other children and to support each other. The PSI Kids seminar helps to unleash the full potential of the child. It allows the child to acquire the tools he or she needs for success in school and in life. Any belly dancer worth her Kohl eyeliner intimately knows the magic that happens every time women put on hip scarves and start dancing. Is it the happy tinkling of coins and beads when the hips gyrate? Or the colorful and flowing costumes that, whether gaily or gaudily accented, unapologetically emphasize feminine curves? On a deeper level, could it be the recognition and expression of one’s inner goddess? Or maybe it is just the strong bond of sisterhood that comes from sharing an ancient art form with roots in nearly every continent? For whatever reason, belly dance has been experiencing a resurgence these past years, with more and more women finding their feminine magic through shimmies, head slides, snake arms and a whole lot more. There are plenty of rewards in belly dancing. Apart from the emotional and spiritual satisfaction that comes from learning to love and work with your body, it is also an effective exercise. Belly dance can burn up to 400 calories an hour and is excellent at helping tone problem areas like the abdomen, thighs, buttocks and arms—all while having fun! With its impact on health and well-being, belly dancing has also gained a foothold in the Philippines, with the best gyms now incorporating such classes. “I am happy that bellydance brings women together, and I believe that in order to enjoy being a belly dancer, we need to showcase our talents, and the Bellyfest is a good avenue for this ” says belly dance teacher Jill Ngo-Crisologo, directress of Peak Performance. Peak Performance is the dance studio that annually organizes BellyFest, a whole-day dance concert featuring various belly dance styles performed by the country’s top belly dance teachers, talents and enthusiasts. The studio is already accepting students who would like to perform as recitalists of BellyFest 2009. It will be held at the Glorietta Activity Center on May 31, Sunday. Anyone can be a part of BellyFest 2009 and experience the rewards of belly dancing. If the past two festivals are any indication, belly dance can be enjoyed by women of all ages, shapes and sizes. Even kids and senior citizens have shared the joy and excitement of the BellyFest stage.